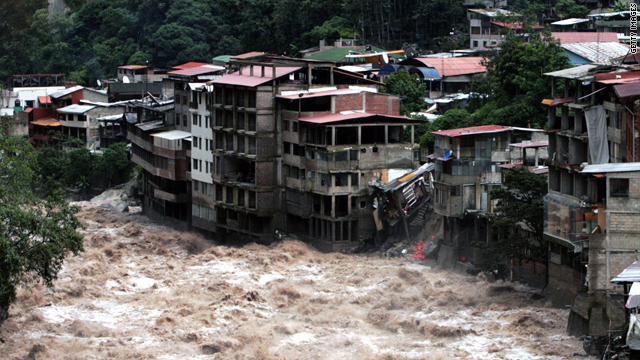 Hundreds of tourists were stranded for several days in January by flooding and mudslides near Machu Picchu in Peru. (CNN) -- Earthquakes. Rogue waves. Tsunamis. Flooding. Landslides. From Machu Picchu, Peru, to Madeira, Portugal, travelers have been socked with one natural disaster after another in recent weeks. If disaster strikes when you are traveling, preparation before departure could be what keeps you safe and gets you home, experts say. "The first step in this is making contingency plans any time you travel so that you are prepared as much as you can be for a situation," said Dan McGinnity, vice president of Travel Guard, a provider of travel insurance and assistance, based in Stevens Point, Wisconsin. That preparation includes bringing along the phone numbers of your travel agent, travel insurance provider, relatives and others who may be able to mobilize help for you and who care about your welfare. It also pays to know ahead of time how to make an international call, McGinnity said. "You can't just dial 1 and the area code and then the number," he said. The State Department also urges Americans to register their itineraries before leaving. This can be done for free at https://travelregistration.state.gov. It's also a good idea to write down local phone numbers and addresses for U.S. embassies and consulates in the places where you will be traveling. • Make sure you have a signed, valid passport, and a visa, if required, and fill in the emergency information page of your passport. • Leave copies of your itinerary, passport data page and visas with family or friends. • Ask your health insurance company if your policy applies overseas, and if it covers emergency expenses such as medical evacuation. If it does not, consider supplemental insurance. • Familiarize yourself with local conditions and laws. For example, satellite phones are illegal in some countries. "If you've done all that, when a disaster should unfortunately strike, you'll be in the best possible position to respond. And if you haven't done all that, then you're going to be sort of making it up as you go along, and that's not a position you want to be in," said John Rendeiro, vice president of global security and intelligence with International SOS Assistance, a travel assistance provider. Among its corporate clients is Turner Broadcasting System Inc., parent company of CNN. "The preparation phase is very, very important. If you've done that, then people will know where you are and will be able to track you," said Rendeiro, who spent 21 years with the U.S. State Department working on diplomatic security. McGinnity strongly advised carrying copies of all your essential documents and keeping the copies separate from the originals. "If you're in a foreign country and there's a catastrophe of some type, you don't want to make things more complicated by not having access to those documents so you can travel home," he said. Additionally, Lawyers.com, an online database of lawyers and legal information, advises travelers carry some extra cash that is only for emergencies; keep cell phones fully charged; take along a few extra days' worth of any needed prescription medicine; keep your most important items -- passport, medicine and cash -- together in a small bag that you can grab in a hurry; and keep someone back home informed every time you move to a new locale. • If you're in your hotel, stay there if the building and area are safe. If it isn't safe, grab your small bag of important items and get out immediately. • If you're out on the street, go someplace safe and away from the immediate danger. • Go the U.S. Embassy or Consulate as soon as possible. Unless it's been damaged by the disaster, you can get food and shelter and assistance getting back home. • If you can't reach the embassy or if it's been destroyed, look for local law enforcement, medical personnel or Red Cross personnel for instructions on where to go. • Don't be surprised if cell phone, Internet and telephone communications are disrupted. Texting often works when voice calls don't, Rendeiro of International SOS said. • During a blackout, only use a flashlight for emergency lighting. • Be aware that routes may be blocked by debris or subject to closure by the authorities with no notice. • Reconfirm your flight as airports may have been affected and might still be closed. The U.S. State Department provides assistance 24 hours a day, seven days a week to U.S. citizens in crisis abroad. Call 1-888-407-4747 if calling from the United States or Canada, or 00-1-202-501-4444 if calling from overseas. Some employers maintain 24-hour assistance lines for employees traveling abroad or contract with someone to provide that service. Even if you're on a leisure trip, this could be a valuable resource during a crisis. Check with your employer before leaving. Many airlines, cruise lines and tour companies have policies and procedures to assist customers, particularly if the crisis directly affects the company's ability to complete a trip. For example, after 26-foot-high waves killed two passengers and injured 14 others aboard a Greek cruise ship in the Mediterranean Sea last week, Louis Cruise Line flew all 1,300 passengers home at its own expense, spokesman Michael Maratheftis said. Once you're safe, if you have Internet access you can put yourself on the Red Cross' "Safe and Well" list at https://disastersafe.redcross.org/. "Every situation is going to be different, but the first thing you want to concentrate on is communicating to someone about your condition, especially if you are injured in some way," McGinnity said. "If someone on this end -- this end being the U.S. -- can be working on your behalf as an advocate and say, 'We know for a fact that this group of people -- this is their status, this is their location, this is the help that they need,' you can start working from multiple angles," he said.